Have You Lost Sleep Due To Barking? How likely are you to contact animal Control? 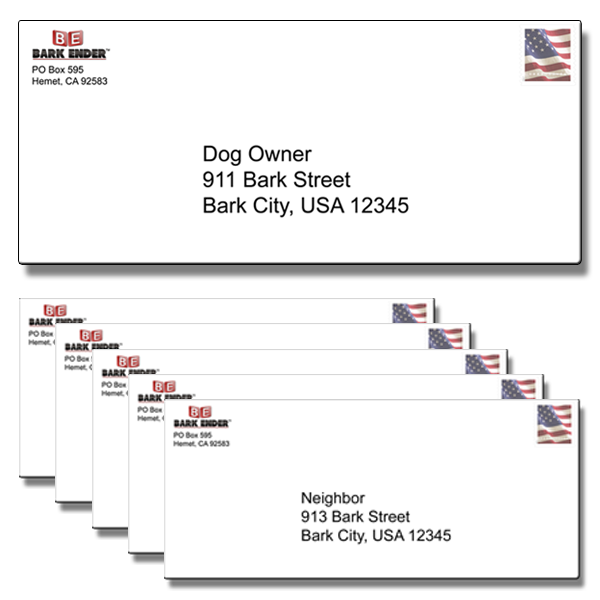 Bark Ender™ Plus allows you to obtain feedback* from the dog owner and anonymous feedback* from up to 5 other neighbors. Bark Ender™ also sends up to 5 neighbor information letters to obtain anonymous feedback* regarding the nuisance dog barking in question. Anonymous Barking Dog Letter to Dog Owner (including feedback* form). Up To 5 Neighbor Information Letters (including feedback* forms). Feedback* form for dog owner includes customer barking information above, with a questionnaire regarding the nuisance barking, along with a dog owner comment area. Feedback* form for other neighbors includes customer barking information above, with the option for other neighbors to answer the same questions regarding the nuisance barking, along with a neighbor comment area. Bark Ender™ Plus allows you to do all of this anonymously. Email address required to receive feedback*. If and when we receive feedback*, we will scan and email the feedback* to the email address on record. Including your other neighbors sends a strong message to the dog owner that you are serious about addressing the nuisance barking. This is easily our most effective service.